Walter exceeded our every expectation. He gave us countless insights about the history, culture, people and places of Singapore. Our experience in this magical city would have been quite mundane without his guidance. He shared so many great experiences from his personal family perspective that gave us great insight. Thank you Walter for giving us the experience of a lifetime. TOUR GUIDE RESPONSE: Thank you for giving me the opportunity what Singapore have to offer. And also in return, I have learnt much from you. It was a blessing to have meet you guys..
Walter was an outstanding guide! He met us at our hotel promptly and took us for an amazing tour of Singapore. We visited Chinatown, Indian Market, the I M Pei designed buildings, Merlion Park, and had a delicious local lunch. We simply could not believe all that we saw on our tour with Walter, from Temples to Modern Buildings. We have friends who have been to Singapore numerous times and they absolutley could not believe all we saw and did on our tour. We highly recommend Walter! We thoroughly enjoyed our made to order tour. It was wonderful to be able to included places we had not been too. Walter was outstanding!! We had a 12 hour layover in Singapore and wanted to be immersed in the Singapore Culture, not just the tourist spots. Walter delivered as we visited the traditional tourist spots, but also spent significant time learning about how the different religions all coexist together as one country. We visited a Mosque, Hindu Temple and Buddhist Temple. It was great having a driver so Walter could focus on the tour, not the driving. We did a lot of walking, but so worth it. TOUR GUIDE RESPONSE: Thank you very much for your compliments !!. Walter was an excellent knowledgable guide. Walter was a joy to be with, and his enthusiasm for Singapore is infectious. Our tour with him was a perfect introduction to the city, and he wove the city's history and culture expertly into all the spots we were taken to. Walter also made it a point to pause at small shops and cafes as a way of sharing more intimate, or 'local', Singapore-oriented experiences with us. Can't recommend Walter highly enough! Walter was a great guide. He knows his city and loves to show visitors the sights along with great history and modern context. TOUR GUIDE RESPONSE: Thank you very much for your rating. I am glad we managed to do the Botanic Garden and cover the rest of the tour. Wishing you and your family a wonderful holiday and a happy new year !! We did the Walking Tour with Walter. I found Walter to be an excellent guide. His knowledge of Singapore is amazing. He took us to the main sites today. It was way more than we expected. I would recommend this tour & guide highly. TOUR GUIDE RESPONSE: Thank you very much for your kind response. I do enjoy your company too. There is so much I have learnt from you. Wishing you a great Golden Wedding Jubilee. May you be forever so loving. Walter was an amazing guide, great passion for Singapore and very knowledgable together with fantastic sense of humour. We enjoyed every minute of our tour and very sad to say goodbye at the end. TOUR GUIDE RESPONSE: Thank you for your kind response. You guys make my job easy. Very friendly and is very interested in Singapore. I hope we would meet again. Yes, goodbye was not easy. A wonderful tour. Walter is an engaging and delightful host in showing off his home city. He was extremely flexible in responding to the time of day of our tour and the best opportunities available. We had a great time. I would heartily recommend this tour and Walter as a guide. We were with a group of 5 who have travelled the world and used many tour guides. Walter was one of the best we have ever had. Extremely knowledgeable, sense of humor and charming. We will pass on his name with out hesitation. Thanks Walter for sharing the love of your country with us. TOUR GUIDE RESPONSE: Thank you very much for your compliments and recommendations. I do hope to get to see George the next time round. Hope he is better now. We had such a wonderful walking day in Singapore with Walter. He has such an obvious love for explaining the historical details and how the people live and work and play. We really enjoyed his sense of humor and playfulness... he made a fun long day of walking so enjoyable. TOUR GUIDE RESPONSE: Thank you Thomas. Yes, indeed I enjoyed the walk with you too. Hope you have great fun in the evening after the tour. Walter was simply great. Very knowledgeable and accommodating to our wishes. Great driver too. I highly recommend him. TOUR GUIDE RESPONSE: Thank you very much David. Hope to see you again when you return to Singapore. 5 star! Just the best!! Wonderful and personalized experience with our guide!!! TOUR GUIDE RESPONSE: Thank you Marilyn. Wish we could spend more time together. TOUR GUIDE RESPONSE: Thank you. The rain did not dampen our walk from Singapore River to Toa Payoh and I had so much fun with the 6 of you. Walter is very fun, knowledgeable and flexible. When we met I expressed I wanted to know more of the history of Singapore. Walter worked it into our schedule and showed us everything plus this added part. You will really enjoy and learn having Walter as your guide. TOUR GUIDE RESPONSE: Thank you Laura. I hope you will come back again and we can have another wonderful time together. We had a great time with Walter. He is knowledgeable and easy to understand. He came with a very modern van and driver with plenty of room for the four of us. I would recommend Walter and his city tour to anyone wanting to see and understand Singapore. TOUR GUIDE RESPONSE: Hi Carl. Thank you for your compliments. I had a very enjoyable time too. I have never been with a group likes yours, a Historian, a Doctor, a Teacher and a Federal Judge !!. This is so amazing !! I learnt a lot from you too. Once again, thank you. Walter was great. We REALLY enjoyed the Merlion and the views of the river with Gardens by the Bay in the distance. The best part was a really intimate glimpse of the Taoist temple provided by Walter--it was fascinating! TOUR GUIDE RESPONSE: Thank you Frank for giving me the opportunity to share my religion with you. Wishing you all the best. Walter is very knowledgeable and we loved learning about Singapore's origins and history with him. He was very accommodating and we had a great morning and learned so many things that we would've missed if we had visited the areas on our own. Thank you very much, Walter. TOUR GUIDE RESPONSE: Hi I would like to thank you too for giving me a chance to share my country, Singapore to you. Walter was knowledgable and funny. Excellent English and very professional. We enjoyed our tour with him. TOUR GUIDE RESPONSE: Hi Neil. Thank you for your kind comment. I am glad you enjoyed the tour. All the best to you and your family!! Walter was an excellent guide and very knowledgeable about World War II history. We had a very interesting day and learnt a lot about Singapore history. Thank you Walter. TOUR GUIDE RESPONSE: Thank you for allowing me to add the Labrador Park in the tour to complete the whole world war tour series. Although we have to overrun the tour by an hour, it was a fruitful and meaningful day for me. I enjoyed our times together. Wishing you all the best and may we meet again. Walter was an excellent guide and shaped the tour according to our needs and wishes. His English was difficult to understand at times although he says he speaks only English at home. This was only a minor problem and was overcome easily. We would definitely recommend him to others. I had the most wonderful tour experience with Walter today. It's my first visit to Singapore and I had only two days so wanted to see as much as I could. I had some definite must sees...hawker food court and wet markets...and was open for anything else Walter suggested. We walked the Chinese,, Indian and Malay neighborhoods and saw many other sights. We talked about many things about Singapore and through Walter,s insight I have a much better idea of what Singapore is all about and now the people live. I had one day to see Singapore. I was able to schedule on short notice a tour by Walter Tan. I spent the morning and early afternoon with one tour guide and finished the day with Walter. Walter was a champ! He knows the Singapore history well. We finished the day with more sightseeing, enjoyed a good meal, and took the river cruise to see the city lights. I highly recommend Walter as your guide and would request him again. Thank you Walter for the great tour and conversation! TOUR GUIDE RESPONSE: Thank you very much Mark. I am glad I did not disappoint. Remember you mentioned Wan Ling set a high standard and it will be hard for me to follow. I enjoyed the tour too and I hope to see you again in Singapore. All the best to you. TOUR GUIDE RESPONSE: Hi Thank you for your kind response and I am glad I was of help to make your stay in Singapore better. Walter was a great guide. He knew his history and gave us a great tour with opportunity for pictures and explanations. We spent 8 hours with him and enjoyed our day. He even helped us plan our next day. Thanks Walter for your time and a great introduction to Singapore. Walter MADE our visit to Singapore. We came away loving the city-state because of his wonderful tour. His English is as excellent as his disposition. He was very flexible and changed the tour as we went along and he learned more of our interests. An example was his bringing us to the Urban Redevelopment Authority which houses incredible exhibits of Singapore's past, present, and future. We think a MUST for anyone's visit. Our tour was the "Made to Order" and we left it to him...a great decision!! Walter was a fantastic tour guide. My wife and I very much enjoyed our day in Singapore and all the things Walter had for us to see. He was very informative, professional and a pleasure to spend the day with! I highly recommend him for an outstanding experience. Walter is an outstanding guide. He is clearly passionate about sharing the details of his country with visitors. Walter is the ultimate professional while showing a caring and personal side as well. We would highly recommend taking Walter's city tour of Singapore. The six hour tour flew by. We left the tour feeling like we really got to know Singapore. Walter was generous with his time and knowledge. He was a pure joy. Walter picked us and and retuned us door to door to the cruise ship terminal. Walter was our guide for three couples for 3 days in Singapore, February 2017. He was fantastic. He was knowledgeable like a professor, kind like a friend, and he was extremely energetic and exhausted us; seeing many more sites than we thought possible - we will be coming back to Singapore in 18 months and will definitely engage Walter again. We have already given his name to two friends. Walter was a great ambassador for the wonderful of Singapore. TOUR GUIDE RESPONSE: Thank you very much. You guys are fun loving people. And it make it so easy to do my job. I enjoyed the four days we spent together. OF course it is my pleasure to share my country history and achievement. You know, I never had so much fun with a lawyer before, Denis was great. He let me see that lawyer can be fun people too. ( I never know that ). Anyway, wishing you all the best and do send my regards to Nancy, Gary, Merlyn and Mike. The tour was very well done. Everything i wanted to see was included. Now i really know , thanks to mr.Tan, more about the rich culture and history of this fascinating city state, one of the greatest success stories of the world. Singapore , you are TOP. !!! TOUR GUIDE RESPONSE: Thank you very much for your kind words. Indeed it was a pleasure to have met you and to share our Singapore history with you. You are very knowledgeable and it made my job so much easier. Also along the way, I learnt so much from you. Thank you for your sharing. Wishing you happiness always. Walter was a delightful gentleman who took wonderful care of us! His enthusiasm about his country was contagious. We learned a great deal about Singapore and it's diverse population as well as enjoyed local food at the famous Maxwell market. He even took us to see a Peranakan neighborhood which was not on the agreed tour. Thank you Walter for a wonderful day! We would recommend him highly. TOUR GUIDE RESPONSE: Thank you for your kind comments. I am glad you had a great time in Singapore. By the way, I am still waiting for your photo you promised to send me.. Very nice gentleman who did his best to show me highlights in such a brief time that we had. Walter was a wonderful guide. His knowledge knows no bounds. We enjoyed the tour so much that we extended it and he was happy to accommodate. I would highly recommend Walter as your tour guide in Singapore. The tour was fantastic, We all enjoyed the day in Singapore. Walter was very knowledgeable and went out of his way to make our day easier. I would recommend this tour for first time visitors to Singapore. TOUR GUIDE RESPONSE: Thank you for your compliments. I am glad you enjoyed the tour. Wishing you all the best. Walter was knowledgable, passionate, interesting and energetic. We covered a lot in our 6 hour walking tour of Singapore and learned so much. It was interesting and fun. TOUR GUIDE RESPONSE: Thank you for your compliments. We cannot thank Walter enough for the informative, interesting & fun tour that he designed for our first introduction to beautiful Singapore. We all had a wonderful morning tour and an exciting night tour with the Supertrees and the river cruise the highlight of our trip. I highly recommend Walter to anyone who wants an insight into Singapore from a local who loves his city! TOUR GUIDE RESPONSE: Thank you for your kind comments. I am glad you and your family enjoyed your stay here in Singapore. All the best to you. Great tour. I saw many things in Singapore that I would not have seen without Walter. We went to several temples, saw lots of the city, and hung out at the waterfront. Walter gave me a great history of Singapore. He could answer any questions I had. He picked me up at the airport exactly when I expected him. He helped me to change money at the airport. Walter speaks excellent English. I could not have been more satisfied. Walter was a wonderful, flexible and knowledgeable tour guide during our stay in Singapore. He communicated with us prior to our visit to find what we wanted to see and to suggest other options. He picked us up promptly at the hotel and got us back in time to catch the shuttle to the cruise ship. His English was excellent which was a plus for us!!! Great tour. I saw many things in Singapore that I would not have seen without Walter. We went on the river cruise and visited several of the sculptures along the river. We also went to the Gardens by the Bay and I saw part of the light show. He could answer any questions I had. He picked me up at my hotel and dropped me off at the airport exactly when I needed to be there. Walter speaks excellent English. I could not have been more satisfied. We enjoyed Walter very much. He is knowledgeable and friendly. He was very willing to custom tailor our tour. Walter guided us expertly through the ethnic maze of Singapore. Walter educated us on the multi ethnic City but still gave my wife enough time for shopping in interesting stores. We enjoyed our tour and would recommend it highly. TOUR GUIDE RESPONSE: Glad your enjoyed the tour. Walter was very knowledgeable about the places that we visited. He knew all the history of the places we went to. We visited Kampong Glam, Little India, Chinatown and Marina Gardens by the Bay. Overall a wonderful tour. TOUR GUIDE RESPONSE: Thank you for your kind words. It was nice meeting you too. We had a fantastic day with Walter. He was very interesting and informative, Extremely friendly and very proud of his country. Thoroughly interesting and enjoyable. Special thanks to Walter for sharing his knowledge and insights, it was a very special morning that we spent with him. Highly recommended and we would hope to do further tours with him in the future. TOUR GUIDE RESPONSE: Thank you Kelvin for your kind words. Walter is a great tour guide. He is very knowledgeable and has a passion for Singapore. My tour consisted of 7 people and Walter was very accommodating to all the requests we made. We were able to customize a tour to our liking and saw all the sights we wanted. I would definitely recommend Walter to any traveler in Singapore. TOUR GUIDE RESPONSE: Thank you very much for your comments and good words!! Walter is energetic, lively and passionate about his city. As newcomers to Singapore, we knew very little. Walter filled the gap nicely while taking us around and showing us the key sites. More importantly than just seeing the sites, Walter told us the story, gave us the background and provided a narrative that brought meaning to what we were seeing. Walter is so informative and can answer all your questions. He customized our tour to meet the desires of a party of six. Excellent clean and roomy transportation was provided. Very kmowlegeable and enthusiastic. 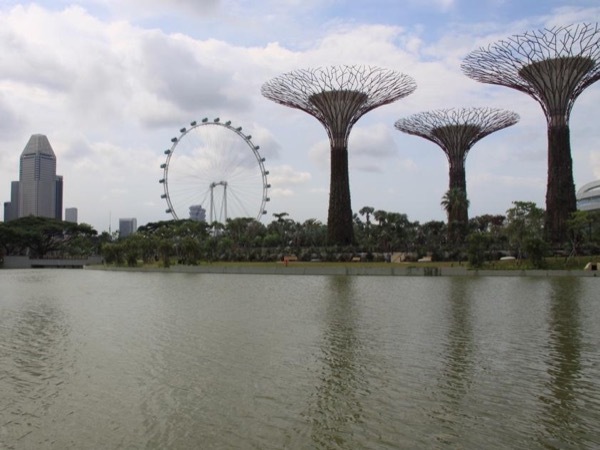 Walter worked with us to customize a 6 hours tour of Singapore while are ship was in port. We did and saw A LOT! Enjoyed everything. Walter, thank you so very much for the great Singapore tour! Overall, a nice tour, but there wasn't enough time to see everything that was previously scheduled with the guide. When it was almost 5 p.m., we were informed that the tour should be ended by that time, otherwise, the driver of the van would put an extra charge. We ended up not visiting the Botanical Gardens (just the Orchid Garden), which was kinda disappointing. If it wasn't for that, we would put 5 stars, because the rest of the tour was excellent. TOUR GUIDE RESPONSE: Thank-you for taking the time to leave your feedback, I am glad you enjoyed the tour! I believe you misunderstood the itinerary as the Orchid Garden is the Botanical garden and if you require more time there than we planned, we would need to hire the driver for more time which in turn would cost more. I do hope you understand and thanks again. Very knowledgable and clear speaking. Would book again in a minute! Walter gave us a 5 star tour. He is knowledgeable and passionate about his country. I would definately recommend him. Despite giving details of the purpose of the visit to Singapore our guide failed to address the information requested. Eg the Jalan Besar Stadium was closed at the time of our visit and the Researcher at Changi Museum was not available at the time of our visit and has not been in contact since to seek further information, despite contact details being given to our guide. TOURSBYLOCALS RESPONSE: The customer has been provided a partial refund due to the fact that the Stadium was closed unexpectedly. The guide has acknowledged his fault and has been coached to prevent issues such as this one from happening again in the future. We happened to be in Singapore during the state funeral for Li Quan Yu and were lucky enough to have Walter for our tour guide. I learned so much more about singapore and its people than I expected. I would highly recommend Walter. We hired Walter for two half day tours of Singapore. He met us promptly and showed us parts of Singapore not usually experienced by a casual tourist. He car was new and in immaculate condition. We would definitely recommend Walter for future tourists to Singapore. We had a great time with Walter at the Old Fort Factory where he was an expert guide. Walter was incredible! He was on time and speaks excellent English. His van is top of the line modern. While he was giving us the start of an excellent tour of "Little India" I became quite ill with what turned out to be a bacterial infection. Walter loaded me as well as my wife, who uses a wheelchair, into his van and took me to an excellent private hospital. Walter stayed with us well past the tour time and got us to our ship in time for our cruise. I highly recommend Walter! The tour was great - gave depth and personality to slick Singpore. Very knowledgable tour guide, engaging and well-planned. Highly recommend.